Birthday, Anniversary, Girls Night Out, Bridal and Baby Showers, Bachelorette, Engagement and Bridesmaids, Date Night, Book Club, Corporate, Office Parties, Team Building, or any other special event, celebrations or request. 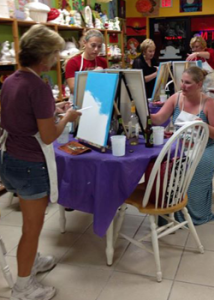 We want to ensure you and your guest have a great time creating a unique piece of art to enjoy for a lifetime! We supply you with 2 hours of studio time in our Private Party Area – you select your party package, date and time. You can bring cake, ice cream, pizza, drinks etc PLUS anything else that you may need to serve your goodies. And we will take care of the rest! Party Invitations are available for a minimal fee of $2.50 for 10 invitations or $5.00 for 20 invitations. A $25.00 non refundable deposit will be required at time of booking. This package allows you to get down and dirty and “make” your own pinch pot from raw clay. Once piece is designed, kids will then paint the pot for that last minute touch..
Painting on canvas is all the craze ~ This is a step by step class and all painters will leave with their masterpiece! Party goers will learn the basic along with some glass cutting safety and design. Party goers will then “design” two glass jewelry pendants! Cost $30,+tax per painter – Includes 2 glasses per painter, instructions and paints. 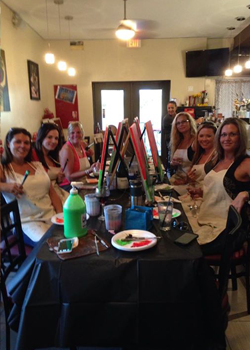 We require a minimum of 8 painters for private events. The host of the party can secure a reservation with a non refundable $50.00 deposit. If the minimum requirement is not met for the party through attendance, the hosts credit card will be charged the balance to meet the minimum. 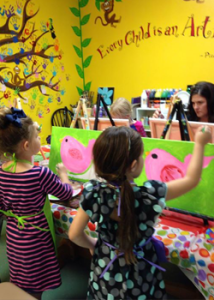 Canvas Painting – $30.00 + tax per painter. Includes 16 X 20 Canvas, paints and instructions. We require a minimum of 8 painters for private events. The host of the party can secure a reservation with a $50.00 non refundable deposit. If the minimum requirement is not met for the party through attendance, the hosts credit card will be charged the balance to meet the minimum. Includes 6″ Glass Base, Instructions and firing of piece.